New questions are being raised about the clinical trial of a widely used heart drug, and critics are calling for an independent investigation, after a medical device used during the study was later found to be faulty and recalled. The clinical trial tested a blood-thinning medication called rivaroxaban, which is now marketed under the brand name Xarelto. More than 13 million Xarelto prescriptions have been written in the U.S., making it the most prescribed blood thinner in its class in the country. Editors at The BMJ, a medical journal based in the UK, have published a paper that raises concerns about the clinical trial -- known as the ROCKET-AF study -- whose findings were published in 2011 in the New England Journal of Medicine. The study compared rivaroxaban (Xarelto) to an older drug, warfarin (Coumadin). The study helped convince U.S. and European regulators to approve rivaroxaban for use in patients with atrial fibrillation (a type of heart rhythm problem) who are at a higher risk for stroke. Warfarin is an older anti-clotting medicine used to prevent heart attacks, strokes, and blood clots in veins and arteries. The BMJ associate editor Dr. Deborah Cohen wrote that the device used to test for blood clotting during the trial was recalled in December 2014 for giving falsely low results. The device maker confirmed to The BMJ that the problem dated back to 2002. The study included over 14,000 patients and found that rivaroxaban and warfarin both prevented ischemic stroke or systemic embolism, an obstruction in a blood vessel due to a blood clot. The study results showed there was no significant difference between the two drugs in the risk of major bleeding -- but bleeding in the brain and fatal bleeding occurred less often in the rivaroxaban group. Cohen wrote that the device flaw could have skewed those study results, making rivaroxaban seem safer than warfarin with respect to the risk of bleeding. Rivaroxaban is manufactured by Bayer and marketed in the U.S. by Janssen Pharmaceuticals, part of Johnson & Johnson. Duke University's Clinical Research Institute, where the trial was carried out on behalf of the manufacturer, published a letter today in the New England Journal of Medicine stating that it has re-analyzed the results of the trial and stands by its conclusions. Issues with the medical testing devices "did not have any significant clinical effect on the primary efficacy and safety outcomes in the trial," the researchers wrote. In a statement to CBS News, Janssen Pharmaceuticals said the re-analysis "confirm the conclusions of the ROCKET-AF study and the positive benefit-risk profile of XARELTO® (rivaroxaban) in patients with non-valvular atrial fibrillation." Dr. Ravi Dave, a cardiologist at UCLA Medical Center, in Santa Monica, California, who's been in practice for 18 years, told CBS News that direct oral anticoagulants (DOACs), including rivaroxaban, have changed the way cardiologists are able to treat patients with atrial fibrillation, or AFib, an irregular and often rapid heart rate that can increase a person's chances of suffering a stroke, heart failure and other cardiac-related complications. "I treat a lot of patients with AFib and when the DOAC agents came out, it was really exciting," said Dave. Warfarin is a higher maintenance medication, he explained. Patients need to be tested regularly to be sure their blood is clotting at the safest level -- too much and a stroke can happen, not enough clotting and bleeding risks go up. Diet also has to be controlled when someone is taking warfarin because certain foods, such as leafy greens with vitamin K, combined with the drug can influence how it works in the body, he said. Patients can also experience interactions with other commonly used medications, including antibiotics. "If a patient with AFib needed antibiotics for a sore throat or something like that, the Coumadin level would jump up really high," said Dave. He said the frequent monitoring and adjustments make warfarin difficult for patients who want to travel for a prolonged time. "It was always a challenge. Our patients would end up going to hospitals in foreign countries and it was a difficult process for them to be checked since the level of the drug had to be maintained very closely. If the level went low, their risk for stroke went up, but too high and their risk for bleeding went up," Dave said. Another rivaroxaban perk: it's a one-dose-a-day drug, without the need for constant adjustments. "The best thing is you don't have to get your blood checked. Patients really like that freedom," Dave said. The BMJ's Cohen wrote that during the drug trial, the use of the faulty device led participants and their doctors to think that their warfarin levels were lower than they really were, and so the patients were given more of the drug. That may explain why warfarin ended up causing more bleeding than rivaroxaban in the study. "In terms of the trial results, it throws doubt onto outcomes used to support the use of the world's best selling new oral anticoagulant," Cohen said. These issues are uncharted territory for regulators. When The BMJ first contacted the European Medicines Agency and the U.S. Food and Drug Administration, both said they did not know that the recalled device had been used in the ROCKET-AF trial -- the rivaroxaban and warfarin study. "What happens to a pivotal drug trial when a device used is found to be defective?" Cohen asked. She said doctors and scientists would like to see an independent investigation and full transparency of the 2011 trial data. The European Medicines Agency told The BMJ it is now reviewing the data, and its executive director Guido Rasi called for further independent investigation into direct oral anticoagulants. "It would be nice to have some independent study carried out to give confidence in the use of this medicine," Rasi said. The FDA says it is "aware of concerns regarding the INR device and its use in the ROCKET-AF trial and is reviewing relevant data," The BMJ reported. The BMJ said Bayer and Johnson & Johnson issued a statement in December saying they stand behind the 2011 drug trial results: "We have conducted a number of sensitivity analyses. 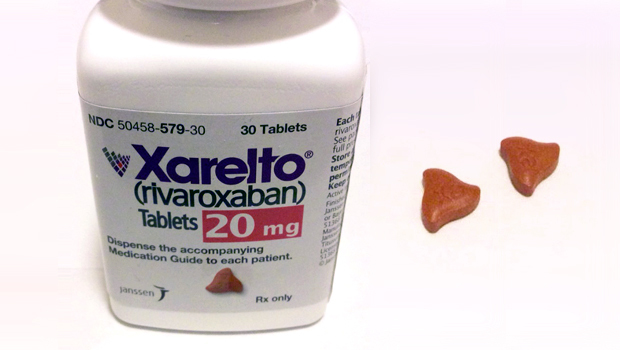 These sensitivity analyses confirm the results of the ROCKET-AF study and the positive benefit-risk profile of Xarelto (rivaroxaban) in patients with non-valvular atrial fibrillation," the companies said. Dr. Chip Lavie, medical director of cardiac rehabilitation and prevention at John Ochsner Heart and Vascular Institute, in New Orleans, said it won't change the way he prescribes medication to his patients. For transparency, Lavie shared that he is a spokesperson for the heart drugs dabigatran (Pradaxa) and apixaban (Eliquis), but not for rivaroxaban (Xarelto). He told CBS News, "Although I personally use more dabigatran, and especially apixaban in my older patients (more so in the older patients with highest bleeding risks), I believe that rivaroxaban is a very good and safe agent and would not change anything based on the BMJ article, which seems a bit 'over the top' to me." He said he also trusted the Duke statements. Dave said he'll keep prescribing rivaroxaban, too. "When this news comes out, we're going to get a lot of phone calls from patients concerned that they're getting a faulty drug. What I'd like to communicate is that these medications are used for lowering the risk for stroke, and I don't think there's any question about how well they work," said Dave. "It was compared to this historic medication Coumadin, which may have had a higher incidence of bleeding because of the faulty machine. Comparing bleeding risk in the two drugs is what is being called into question and what needs to be further evaluated. Not the efficacy of this drug. Rivaroxaban is not being called into question," he explained. "I will not change clinical practice." Dave's UCLA colleagues, Dr. Sheila Sahni, chief fellow in cardiovascular disease at the David Geffen School of Medicine, and Dr. Karol Watson, professor of medicine and cardiology director of the UCLA Barbra Streisand Women's Heart Health Program and co-director of the UCLA Program in Preventive Cardiology, told CBS News that the new BMJ investigation is "very important." Sahni said it highlights the fact that devices used in studies to track blood clotting factors are often not regulated. Watson added, "After ROCKET [the 2011 study] came out, we would counsel patients regarding the decreased fatalities and intracranial bleeding." But until further investigation is conducted, as The BMJ article calls for, the patient-doctor dialogue will change. As Sahni put it: "We can say with confidence that rivaroxaban works. However you can't say it's better than Coumadin."